Get ready for Xcrawl, the live-on-pay-per-view death sport RPG, now powered by the unstoppably old-school Dungeon Crawl Classics rules! 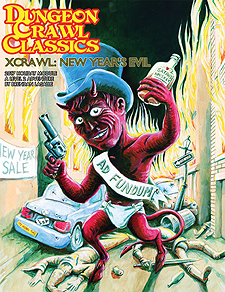 And this holiday season, Xcrawl is breaking open a bottle of over-the-top dungeon crawl insanity, and serving it up for some New Year's Evil! Strange things are afoot in Toronto! The spirit of the New Year is driving the Gods to drink, whipping the fans into a frenzy, and inspiring the staff to start the party before the team even makes it into the green room! Can a low-level squad, faced with shady jousters, wet jesters, hell pugs, and cubical zombies - not to mention poetry, puzzles, and traps galore - survive to ring in the New Year? And will the sponsors still pick up the tab now that the dungeon has gone mad? Start the countdown! Nunc est bacchandum atque Xcrawl ludendum!